Beautiful set of pitching shoes for your outdoor games. 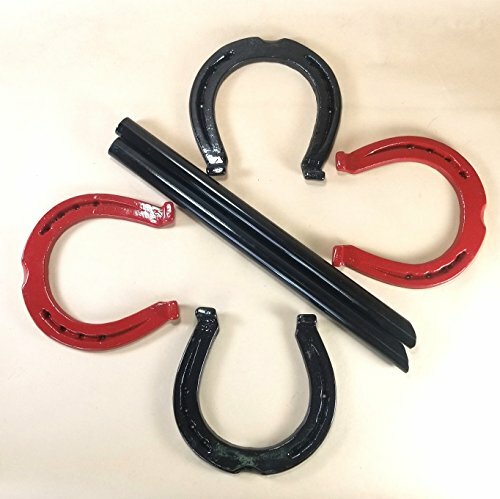 Heavy clydesdale horseshoes in cast iron. Painted black and Red. Comes with two 15" stakes, beveled on the ends. Just get a mallet and hammer them into the ground. Set them close or far, these are just for fun, they are not regulation weight since they are clydesdale molds. We tested them in our yard and they are tough and ready. Note that the paint will be removed when playing. That is the natural condition of horseshoes. Easy to repaint yourself if you want or leave in natural "beat up" condition at the end of summer. Great family fun. Not recommended for children. Adult supervision only. If you have any questions about this product by Carver's Olde Iron, contact us by completing and submitting the form below. If you are looking for a specif part number, please include it with your message.